I very rarely eat mackerel which in part is the result of one of my mother's storecupboard specials. She's not going to like me much for recounting this story, as nearly 10 years later she's still not heard the last of it. But I'm going to tell it anyway. It was a Sunday night, much like tonight, and she was raiding the fridge for some dinner for me, my father and herself. It goes without saying that mackerel and new potatoes is an excellent combination, but in lieu of mayonnaise to dress it - we had none - the fish and potatoes were covered in some Thai green curry sauce that was in the fridge. The result was, shall we say, memorable. 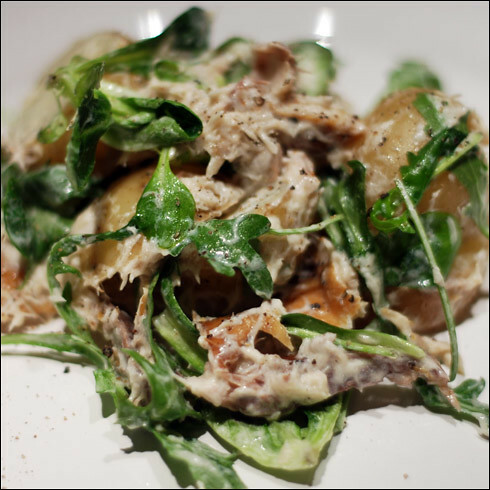 But, back to the original point - mackerel and new potatoes are delicious together, and with a little horseradish and creme fraiche, you have a delicious Sunday night supper. I served this with a couple of slices of homemade bread. If the new potatoes are particularly big, cut in half or into thirds, and then boil for 20 minutes, until cooked. When done, drain the potatoes and transfer to a large bowl. Next, remove the skin from the mackerel fillets (it should peel off very easily) and flake into the bowl with the potatoes. Add the crème fraîche, lemon juice, horseradish and a little salt and pepper and mix until there is an even covering of dressing on the fish and potatoes. Stir through the lambs lettuce and rocket and serve immediately - it is most delicious while still warm. Thanks Hannah, I think mackerel is actually quite underrated. I'm always surprised at how good it is when I actually eat it. Mackerel pate sounds delicious too!